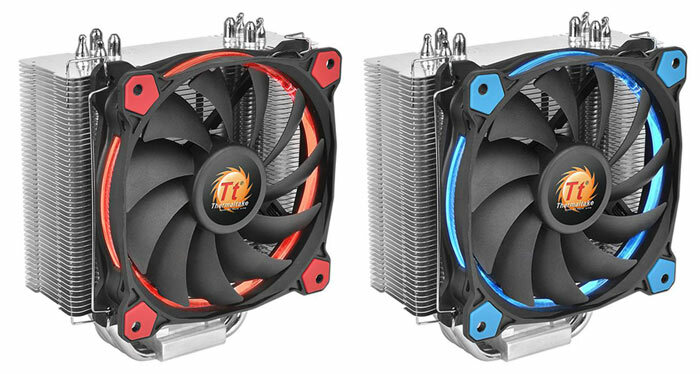 PC chassis, components and accessories specialist Thermaltake has unveiled a pair of new CPU coolers. The coolers are equipped with hydraulic bearing 120mm PWM fans and are said to provide "impressive cooling performance" at "ultra-low noise" levels. These coolers get their 'Riing' name from the distinctive LED lighting effects they produce. As per the headline, Thermaltake has unveiled two models; one with blue LEDs and another with red LEDs. 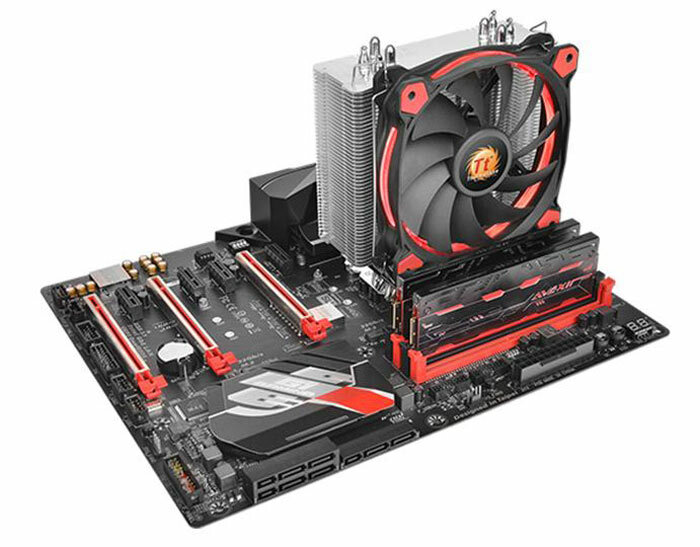 If you are in the market for a heatsink and fan based CPU cooler designs sporting a 120mm fan are among the best choices if they fit in your system as the larger fan can turn slower to move sufficient air during its cooling duties. Reinforcing its inherent qualities, Thermaltake says that its fan uses hydraulic bearings for "silent operation". Furthermore it says it has optimised the fan blade design using 11 contoured elements, thus providing the best balance between noise and performance. Thermaltake's 'Wind Blocker Frame' condenses the airflow creating a compression effect beneficial in directing the airflow to where it is needed most, plus it hinders unwanted vibration effects. The Riing Silent 12 CPU cooler uses optimized 0.4mm thickness aluminium fins with 2.2mm air gaps, 4 x Ø6mm solid copper heat-pipes, and direct copper contact with the CPU, for efficiency. Stabilising the rather bulky design, and further keeping any associated noise at bay are pre-installed anti-vibration rubber pads. Above and beyond its fan and heatsink design considerations, PWM functionality helps spin the fan to its optimum speed depending upon CPU demands. Finally, to top it all off, you have the patented LED ring lighting effects. The cooler is compatible with most modern PC systems and is supplied with a low-noise cable (LNC). About time CPU/GPU coolers took a leap forward in in innovation. Not much has changed in 10+ years. Why aren't there any photos of this thing in the dark? Still solving heating problems with spinning thing. Innovative ! I don't know what's happening with all such companies & their R&D's.